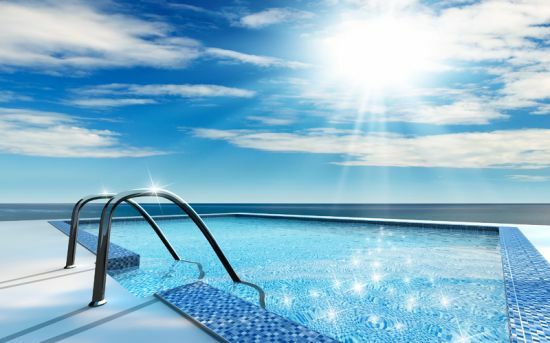 Hard water stains on your pool tiles appear as a cloudy white residue caused from large amounts of minerals in the water, such as calcium limestone and magnesium, and as the water evaporates, mineral deposits form on the tile. Thankfully, you can remove the stains with chemicals you already use in your pool, but it takes some elbow grease. You may be tempted to drain your pool to remove the stains, but the cost and possible pool damage make this a last resort option. Move the container of muriatic acid outside for proper ventilation. Wear rubber gloves, eye goggles and a respirator before opening the container. Fill a plastic bucket with 1 gallon of water. Use a plastic measuring cup and slowly pour 8 ounces of muriatic acid into the water. Never pour water into muriatic acid, as adding water could cause undiluted muriatic acid to splash. Label your measuring cup as “muriatic acid only” and use it for your pool in the future, or dispose of it properly. Stir the water and muriatic acid slowly with an old plastic spoon or a piece of wood that has no paint or printing on it. Do not mix the water and muriatic acid too quickly, as it can produce heat and begin to boil. Make sure you properly dispose of the spoon or the wood after mixing, or label it for use with your pool in the future for muriatic acid only. Fill a plastic spray bottle with the water and muriatic acid mixture. Make sure you label the spray bottle, or dispose of it properly. Spray the pool tiles with the muriatic acid mixture. Use a nonabrasive scouring pad to remove the hard water stains. Do not attempt to clean the tiles from inside the pool. Although you use muriatic acid in your pool water to help maintain the chemical balance of your pool, you are still working with a diluted acid. Dispose of any unused muriatic acid mixture. Contact your local municipality to inquire how to properly dispose of the acid. You can also contact your pool supply company, as they should be familiar with your municipality’s regulations. Take a sample of your pool water to your pool supply company. Have the pool water tested to determine the level of hard water in your pool. They can recommend chemicals to use to avoid hard water stains in the future, as hardness levels vary from place to place.